Travel with Kevin and Ruth! : Arrived in Nova Scotia! We had visited with my Mom and she took us out for lunch to a nice Indian restaurant and Ruth and I enjoyed curry for lunch. When we find a restaurant that has good food at reasonable prices we have no problem telling you about it! For lunch in the west end of Ottawa, go to Mia's Indian Cuisine! Made it back to Ruth's father's place in Galetta and stayed up late watching the Red Sox vs Detroit Tigers game for the American League Divisional Series baseball. Sunday was pretty much a day of rest. I drove down to the west end of Ottawa to pick up our son Alex and bring him back up to his grandpa's place for the night. We stayed up late watching the baseball game again. Huge Red Sox comeback in the 8th inning. Go Red Sox! Monday morning, Ruth's dad came with me to drop the little blue car at the storage place. I've got a prepaid season of indoor storage, so we decided to use it. The little blue car has been very good to us and although we don't know for sure when we'll be using it again, we decided to keep it instead of selling it. It will be raring to go whenever we decide to use it again! It was Thanksgiving Monday here in Canada and Ruth had invited my mother and sisters and nephew up for dinner. But first, Alex and I had some work to do. Ruth's dad heats his house mostly with wood in the winter, and winter is coming! So he had a couple of loads of wood dropped off in the driveway and it needed to be stacked. Our son Alex, and Kevin...stacking the firewood. Everyone arrived for dinner, and Ruth and her sister Lesley made a Thanksgiving feast with turkey and all the trimmings. Deeelicious. We were stuffed just like the turkey had been! Big gathering for Thanksgiving feast! Tuesday was our travel day. We love travels days! Ruth and I spent most of the morning getting things sorted and packed. Even though we aren't bringing very much, it was difficult deciding just what to bring. We are going from here to New York City, to Africa, back to New York City and then directly to Cancun, Mexico. And we want to travel light, but we'll be having some extremes of climate so it's tough to know what to take with us. It's a difficult lifestyle in this regard because we end up with our "stuff" spread all over the place. We have things in my sister's basement, in Ruth's father's basement, in our motorhome in Mexico, and in our "cabin" at Sturgeon Lake where we worked this past summer. And we're hoping to leave some things with whoever we stay with in New York City so we can retrieve them when we return in the spring. All packed up, and off to the Ottawa airport with lots of time to spare for our 1:25pm flight to Halifax, Nova Scotia. Our flight route from Ottawa to Halifax. There are three major carriers that fly within Canada. Air Canada, Westjet, and Porter. I had never flown with Porter before, but they had a great sale on last July and I paid $157 each for our one way flights between Ottawa and Halifax. Considering most of that is taxes, it was a great price and we never did see it get any cheaper. Very happy with Porter Airlines. It was a small Bombardier turbo prop plane that seated around 72 people. The flight was about an hour and a half and the two stewardesses did a great job looking after us. Porter still serves beer and wine included in the price of your flight! Enjoyed roasted almonds with my glass of Steamwhistle beer. Ruth had a glass of wine that she said was very nice. Glad to see an airline that hasn't forgotten about what makes a customer happy! We had a nice view of Montreal. Our daughter Lindsey was there to pick us up. She brought our granddaughter Sadie who we hadn't met yet. Sadie was only born on August 29th, so it was great to finally meet this new addition to the family. We had an hour drive to get to her place from the airport where son in law Justin and grandson Cameron were there to meet us. So good to see them all again as it has been about a year since the last time. Of course we'll have lots of family pics for you over the coming two weeks or so. Lindsey and Justin's house is in a beautiful spot overlooking a valley and farmland. Our view out Lindsey's backyard this morning. Sure sounds like you're having some wonderful family times before you head across the ocean. I have trouble believing that there is still an airline that offers any kind of service. We are really enjoying our family time. Porter is a great airline and we were totally impressed with it. Glad you made it to NS safely... The pics out the port-hole are very good; the new camera is working well... Enjoy the NEW g-kid, g-ma... And Cameron, PICS, PLEASE !!! Hope every day is a HAPPY DAY !!!!! The pictures out the porthole were actually taken with our little camera. Don't worry there will be lots of pictures of the grandkids! Our oldest daughter flies Porter quite frequently and she's only had one less than stellar experience. Had to do with lost luggage, but they got it the next day. Might not have completely been the fault of the airline either. I'm not sure how that works. *Most* of the European airlines still offer wine or beer on their flights. I don't think the discount airlines do, but it sure is nice to have a drink if you chose to, and not have to come up with "exact change". What a goofy idea. I don't even mind so much paying, but if I'm paying could you at least have some change for me? What's the thought process there, anyway? I've wondered sometimes about your "stuff", and just how you manage the vagabond lifestyle. It's tricky I would imagine. I have enough stuff issues with just this house. Sounds like one not so good experience on Porter is pretty good odds if she flies with them lots. Yep, seems like we still have too much "stuff"! Thanks Connie and Barry, we certainly are going to enjoy them as much as we can while we are here. We find that Nova Scotia is a beautiful province, maybe not as much to offer as British Columbia in scenery but it is a very close second and super friendly people. You all are making your way east quickly! 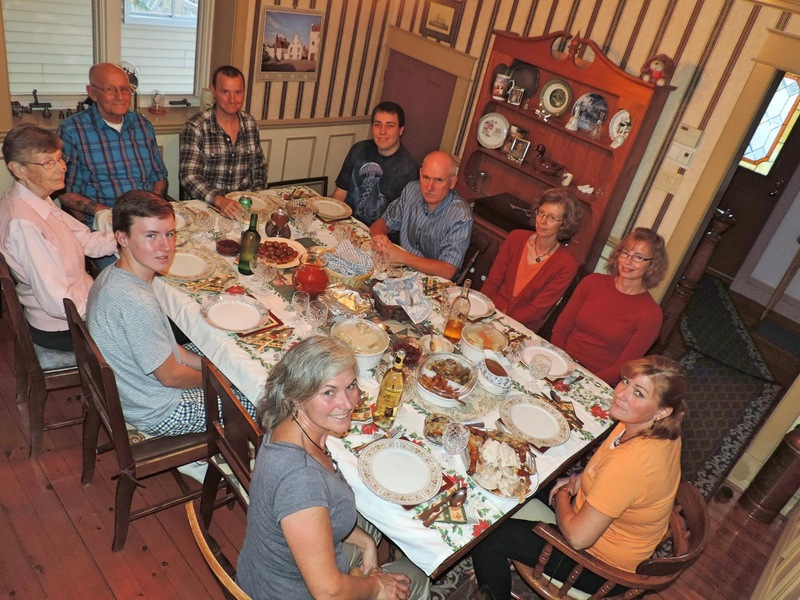 Great pictures of the family at Thanksgiving! Looks like a good flight and some good snacks on the flight. It was really nice to spend Thanksgiving with both our families while we were in Ottawa. We don't get the opportunity to that very often with our family. Nice that you are now in Nova Scotia for a bit, enjoying more family time before you are on the move again! We are happy to be here to spend just over two weeks with Lindsey and her family. NIce you got to meet your new granddaughter. Amazing to hear of a Canadian airline serving free booze. I paid $6.50 for a glass of wine last week on Westjet. We loved meeting Sadie and now spending time with her and Cameron over the next couple of weeks will be so much fun. Have to admit that we didn't have anything bad to say about Porter, they exceeded our expectations in many ways. I'm so happy to read your travel plans are rolling along smoothly! Can't wait to see the updated photos of the Grandchildren!!! It was a wonderful arrival gift! There will lots of photos to come, you can be sure of that. Having left stuff at the campground in Saskebush, are you planning a return next summer? There is a very strong possibility that we will return but it is not written in stone yet! Love the photos of NS, especially as John and I plan to re-visit the east coast next summer. It's been 30 years since our last visit, so it's definitely time. As for Porter, our daughter has flown with them many times, and again, great service. SO nice to hear flying can still be fun! We are certain that you will enjoy your visit here next summer. 30 years is a long time, I am sure you will see many changes. Definitely loved the Porter service, other airlines could learn something from them.